By popular demand (actually, Doug McBurney said that he loved the first show we did a couple weeks ago), Kevin Anderson is back with Bob Enyart on Real Science Radio! On today's program, Bob asks Dr. Anderson, as a molecular biologist, about one of RSR's latest favorite topics, the targeted antibodies cancer treatment revolution! Astounding 2017 UPDATE: Our actively maintained page rsr.org/targeted-antibodies, reports in March 2017 of "Terminal cancer patients in complete remission after one gene therapy treatment". Two points from that article reinforce Bob's discussion with Kevin, "The treatment, which has been dubbed 'a living drug' by doctors, works by filtering a patient's blood to remove key immune system cells called T-cells, which are then genetically engineered in the lab to recognise cancer cells." Also, reminiscent of Dr. Anderson's statement that, given the opportunity, when roadblocks are removed, "The immune system cannot be defeated," London's Telegraph reports that while cancer cells are good at evading the immune system, "the new therapy essentially cuts the brakes, allowing immune cells to do their job properly." Bob Enyart interviews molecular biologist and dinosaur researcher Dr. Kevin Anderson, director of the Van Andel Research Center in Chino Valley, Arizona about the iDino Project he is running for the Creation Research Society. Kevin is one of the history-making scientists who have published in prestigious scientific journals their discoveries of dinosaur soft tissue! See also Kevin's work at rsr.org/triceratops and get his book, Echoes of the Jurassic, online at the CRS Bookstore! * On the Hesitance Over the Immune System: Discover magazine reports in an article on the father of cancer immunotherapy William Coley that, "Since the 1960s, the medical community has gone back and forth as to whether the immune system could be made to launch an anti-tumor offensive." 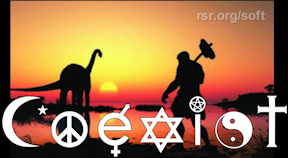 * RSR HIGHLY Recommends this Special CRSQ Edition: Long-time RSR listeners may recall Bob Enyart's paper published in the peer-reviewed journal, Creation Research Society Quarterly, Dobzhansy: 40 Years Later Nothing Makes Sense. Now, see the highly recommended iDINO Project Special Report from CRSQ! You can click to view the abstracts but RSR highly recommends purchasing this important and historic issue, which you can find also at tiny.cc/crsq-dino-soft-tissue-ed. 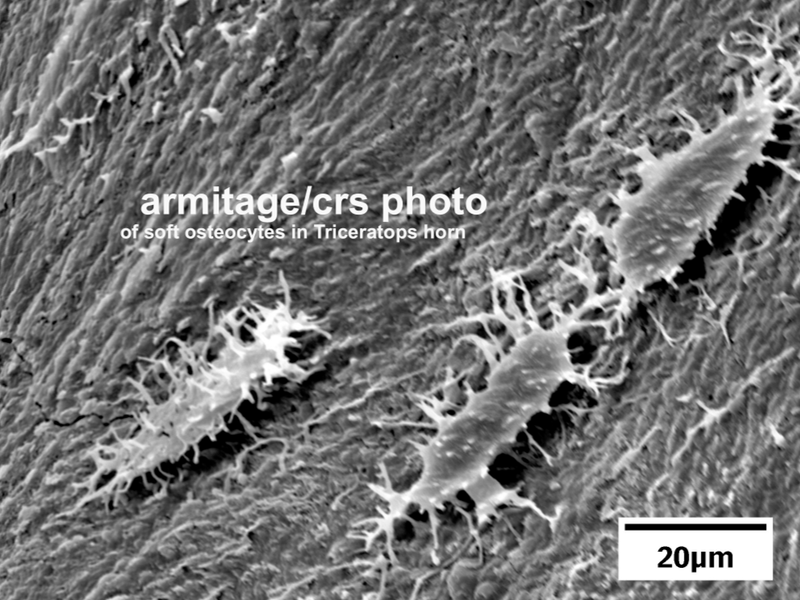 * Interview & Photo from iDINO Project: iDINO presented to Real Science Radio this formerly unpublished photo (right) of soft tissue in a Triceratops horn. It's beautiful! (Well, in the eyes of the beholder, anyway. But God Himself probably thinks it's pretty cool too!) These slender soft-tissue osteocytes came from the triceratops horn excavated from the Hell Creek Formation in Montana. As with scientists from Harvard, North Carolina State, and dozens of other universities and institutions, they broke open the horn and... guess what? * Journals including Acta Histochemica Publish Finding: One of the latest of hundreds of peer-reviewed papers published by Darwin Doubters and even by (say it's not so) creationists, the prestigious secular journal Acta Histochemica has published the paper by Dr. Kevin Anderson and Mark Armitage titled, Soft sheets of fibrillar bone from a fossil of the supraorbital horn of the dinosaur Triceratops horridus in Volume 115, Issue 6, July 2013, pp. 603–608; Mark Hollis Armitage, Department of Biology, California State University, 18111 Nordhoff Street, Northridge, CA 91330-8303, USA; Kevin Lee Anderson, Department of Biology, Arkansas State University Beebe, Beebe, AR, USA. Other aspects of this discovery were published in the Cambridge University journal Microscopy and Microanalysis. * Another Creationist Dinosaur Prediction Confirmed: The science prediction by co-author Mark Armitage in the video below, uploaded to YouTube in December 2014, was confirmed in June 2015 when the journal Nature Communications reported that endogenous (original) soft tissue was found in six of eight dinosaur bones investigated, leading to the conclusion that "preservation is more common than previously thought." As co-author of one of the primary papers In a prestigious peer-reviewed science journal documenting dinosaur soft tissue, Mark said about this finding: "My prediction is this. The fossil record is full of soft tissue. This is the norm, rather than the exception. That's my prediction." This was an independent record of the obvious implications of biblical creation, for at rsr.org/predictions, also in 2014, we published our own prediction: "Dinosaur soft tissue will be found not only in rare circumstances, but rather easily, i.e., when looked for." CONFIRMED! * Check Out Our Full RSR Dinosaur Soft Tissue Page: Our rsr.org/dinosaur-soft-tissue page presents the web's most complete catalog of peer-reviewed journal papers confirming the existence of original biological tissue from dinosaurs! * Whose Expectations Are Met? Evolutionary expectations are based on their belief in millions of years, whereas based on Egyptian mummy research, young earth creationists do expect some dinosaur soft tissue preservation. And see science deniers and science doubters including (even as late as 2015) PZ Myers, at rsr.org/soft-tissue-doubters.